Bob Tullius was a racer. When he took on racing, he drove many types of cars, from Dodge Darts to Ford Mustangs, then Jaguar Es, XJS, Triumph TR8s and later, Jaguar XJR5s and 7s. He had a British Leyland dealership and when he took part of the GTP series, his goal was to improve the Jaguar image. At the end of the 1975 season, the Jaguar E was no longer produced and British Leyland needed a new flagship. Lord Stokes showed no interest in auto racing, but Michael Dale, British Leyland Vice President of Sales, remained enthusiastic about racing the XJS. He worked closely with Bob Tullius on the XJS program. The very first race for the XJS was at Mosport Trans Am in 1976. Bob Tullius led for most of the race in category 1, in which the car was entered. However, the car experienced air cooling problems, preventing him from close racing action. He finally took fourth. When he entered IMSA for the first time, it was at Daytona in 1976, for the traditional year end Finale. He drove the Jaguar XJS that had been previously entered in the Trans Am series. Powered by a V12 5,3L, the car was a little short of power, but Bob Tullius was running fourth at halfway point, but he had to retire when the car's interior temperatures became unbearable. In 1977 and 1978, the team concentrated on the Trans Am series. The car development was Brian Fuerstenau's responsibility, while Latton "Lanky" Foushee was the chief mechanic. As tubeframe cars were not still introduced, the process of building the car was mainly that of stiffening the chassis through the means of a roll cage. The use of a new oiling system was taken care of much attention. A dry sump arrangement was employed and the original fuel injection, used on the customer cars, was replaced by six twin-choke carburetors. A 4-speed manual transmission was used, and it came right from the European version of the car. In 1977, Bob Tullius was the new category 1 Champion, but the team lost the manufacturers Championship to Porsche by a mere two points. In 1978, a car was built, and the car was better than the previous one in two ways : 20 hp were gained and the car had less weight. Although Bob Tullius started slowly, he ended the season with a seven races streak. When the car began its racing career, the engine was given for 475hp. At the end of its first season, 65 more hp had been gained. The Jaguar XJS did very well and posted two category 1 Championship wins. In 1979, Group 44 entered the Triumph TR8 which won two races. It was decided to race it in the IMSA GTO class in 1980. The car was impressive at Sebring and won its class with a fourteen laps margin. At the end of the season, it was Luis Mendez who took the GTO title despite some very good showings for the 3,5L V8 powered Triumph. Victories at Daytona, Mosport and Road America were not enough to secure the GTO title. The Jaguar XJS was back in Trans Am Racing in 1981 and finished second to Eppie Wietzes in a Corvette. The car the team had built was quite different from the beginnings, as it featured now a full tubeframe chassis. It was the standard by now and Bob Tullius took three wins, while Eppie Wietzes was more consistent, and he won the title. After this last Trans Am season, the Jaguar XJS would be seen on a very last occasion at Daytona in 1982. The car was driven by Bob Tullius, Bill Adam and Gordon Smiley. Too much developed to be eligible for the GTO class, it was moved to the GTP class, against the Porsche 935s, Lola T600s and March 82Gs. They finished twenty first overall. Gordon Smiley had planned to run the Jaguar XJS in the Trans Am series in 1982, but he was killed later at Indianapolis, and the program was dropped. That would be the last year Group 44 would run a GT car. The goal assigned to the team was clear : they wanted to improve their image. So it was decided to launch a new prototype that would be called the XJR5. Bob Tullius had commissioned Lee Dyjkstra to build the car. He had achieved many glorious cars, including the Dekon Chevrolet Monza, the CRC Can Am car. Everything had to use authentic Jaguar parts and they had to use the V12 5,3L engine. The car had to be legal for GTP and Group C Racing. The car was sleek and used the usual V12 engine, given for 530hp. The very first race was to be at Road America, where Bob Tullius and Bill Adam ran a very conservative race to finish third overall. For this very first event, the team could see the new GTP car appeal to the marshals as they clapped their hands while watching the new car running for the first time. The remainder of the season proved to be much more difficult to handle for the team as a succession of woes occured. The car experienced a practice accident at Mid Ohio and was forced into the wall at the Daytona Finale. The drivers and the team had to learn how to develop the car and it took a lot of time to apprehend it. The 1983 season would be hard in the beginning, yet success was to come by quickly. They failed to finish the two first enduros of the season, but at Road Atlanta, Bob Tullius and Bill Adam survived typically wet conditions to record their first win. It was the first major win for the marque since long. Then the car won at Lime Rock. The car won its first pole position at Portland but had to retire from the race after Bill Adam collided with Jim Mullen's car in the race. The car now was able to be fast on the track, while reliable. The team won again at Mosport but, later, Bill Adam would be fired from the team. Bob Tullius had replaced him by Doc Bundy, hoping things would improve with time. The new Bob Tullius-Doc Bundy pair won at Pocono their fourth race of the season. At the end of the season, Bob Tullius was second in points, to Al Holbert, winning in his March 83G Porsche. For 1984, the team lost the Quaker State sponsorship. After considering any collaboration with the team, Miller Brewing Company, with its Löwenbräu brand, decided not to go further with Group 44, so the 1984 season began with no sponsor but Jaguar. The Daytona 24 Hour race began with a retirement, after leading the race for more than a hundred laps. Bob Tullius-Doc Bundy and David Hobbs were rewarded with a third overall. Two cars were entered for most of the season for Bob Tullius-Doc Bundy and Brian Redman-Hurley Haywood. The main success for the team was a one-two at Miami with Brian Redman-Hurley Haywood taking victory over Bob Tullius and Doc Bundy. The team took a third at Road Atlanta and second and third on the high banks of Charlotte Motor Speedway. A third at Watkins Glen and a second at Portland, a second and third at Sears Point and a second at Pocono was not so bad for the team who had however great hopes but ended up the season quite disappointed. pistons in practice. Realizing after the race that they had been awarded a bad batch of fuel by the organizers' fuel supplier, they had detuned their engines for the race. For the race, things went mildly with car number 44 finishing thirteenth after a cylinder dropped ninety minutes short of the chequered. Bob Tullius was rewarded with the cheers of the crowd while passing the stands. Back to US, the team had a string of seconds and thirds, but no win. It was time for the team to develop a brand new car, the XJR7, which was entirely new, except for the windshield. The car was debuted at the Daytona Finale, for Bob Tullius and Chip Robinson. The XJR5 took a second place with Hurley Haywood and Brian Redman, while Bob Tullius and Chip Robinson finished fourth after an early incident with the wall. The 1986 season began at Daytona with two XJR7s running. The two cars experienced gearbox problems caused by drivetrain overload from the chassis. The number 44 car, driven by Bob Tullius, Chip Robinson and Claude Ballot Léna, finished sixth overall. A new gearbox was installed for the Sebring race, but neither car finished the race. Lee Dykstra and Bob Tullius had ceased their relationship prior to the race. In fact, Jaguar wanted to hire him, which they did, so Bob Tullius had to fire him. Things changed a lot after Lee Dykstra's departure, and the relationship between Bob Tullius and Jaguar worsened. The race held at Riverside was reminded for everyone as one of the most spectacular crashes ever. 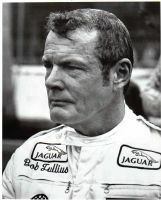 Chip Robinson collided with Doc Bundy and Lyn St James on lap thirty six, resulting in the Jaguar flying up in the air. Fortunately, neither driver was hurt but the three cars were completely written off. This major incident resulted in Group 44 entering only one car for the next round at Laguna Seca. The third chassis had been damaged in a practice session. Hurley Haywood was partnered by Chip Robinson and they finished second to Klaus Ludwig, who gave the Ford Probe its first win. The remainder of the season was a succession of dnfs, mainly caused by crankshafts. They had to revert to older parts and had a third place finish at Columbus for Brian Redman and Hurley Haywood. The end of the season had a special taste, because Chip Robinson and Brian Redman were leaving the team. The team scored its only victory at the Daytona Finale with Bob Tullius and Chip Robinson while Brian Redman and Hurley Haywood had a dnf, with an engine failure. The 1987 season began at Daytona with a dnf for the sole Jaguar XJR7 entered, due to overheating. The car had run as high as second during the race. The next race, held at Miami, rewarded an ignominous tenth to Hurley Haywood and John Morton, while Nissan scored its first IMSA victory. The next race was a great success for the team : Hurley Haywood and John Morton won the Riverside race over Al Holbert and Chip Robinson by a 2.78 second margin. Things were getting tight between Group 44 and Jaguar. The team felt that they lacked support from the British marque. Yet, for the season to come, Jaguar had chosen Tom Walkinshaw to run their IMSA cars and then it was over. The team entered the West Palm Beach race, and it would be the very last IMSA win for Group 44. John Morton and Hurley Haywood won over the Al Holbert Porsche 962. The last official race for the team was held at Watkins Glen, where Bob Tullius and John Morton finished thirteenth. From Bob Tullius point of view, things were sealed from the beginning. They entered the last race of the season at Del Mar, but not under the Group 44 banner. The team was entered in a single event in 1988, and the car was dubbed "Group 44 V12". The very last race for the Group 44 Team occured at Daytona in 1988. The "Group 44 V12" car was powered by a Chevrolet engine and retired early in the race. Bob Tullius, John Morton and Whitney Ganz had a very disappointing last race with a retirement at 7.55PM, due to an overheating. The team signed to run Audi Quattros in the Trans Am series, and they earned the title with Hurley Haywood driving. Hans Stuck and Walter Rohrl were part of that dream-team. However, Bob Tullius had still GTP hopes, and had a car built by Randy Wittine. It was based on the last XJR7 chassis and was powered by a Chevrolet engine. He had in mind several chassis that he wanted to sell as customer cars. But the project did not arouse sufficient interest to build a second car. The story of Group 44 in IMSA was over, and it was as if Group 44 had never existed. When speaking about Jaguar history, Group 44 is never quoted as a great team, and very few people think of them as Jaguar spearhead. Yet, they must be credited with many wins, and they have brought back Jaguar to their first international wins. The Jaguar XJS, Triumph TR8, Jaguar XJR5 and XJR7 have succeeded in many races, and the Group 44 team has achieved some great successes. However, the team has always been underestimated, and it is a shame for every Jaguar or Triumph lover. The Group 44 team remains one of the most successful team in SCCA and IMSA racing. They deserve a better recognition from everyone.